HURRY! ONLY 1 of 6 TABLES LEFT! Now is your chance to own one of the 6 official 22' shuffleboards used in the 2018 Women Wandering the World Shuffleboard Tournament at a great price! 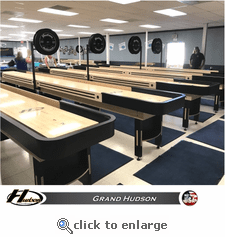 Played on by the best women shuffleboard players in the world, these 22' tables are constructed of the finest materials and built from the ground up 100% in the USA! The 2018 Wandering Women of the World Tournament will take place September 12-16 at the Downey Elks Lodge #2020 in Downey, CA. Once the event is finished, these tables will be cleaned, polished, crated, and then ready ship to you. Installation is also available. Also Included is One Set of Eight Playing Weights, 2 Bottles of Speed Powder, One Can of Silicone, 5 Inch Adjustable Leg Levelers, and One Board Wipe. Enjoy Playing Shuffleboard on the Same Tables used by the Best!